More and more people are discovering that their ancestors came from Monaghan and particularly North Monaghan and through this site they make contact to see if they can trace those ancestors. The most recent was a very satisfactory experience as a member of a Roberts family contacted me to see what we could find out as they knew that a great great grandfather was from 'Emyvale'. 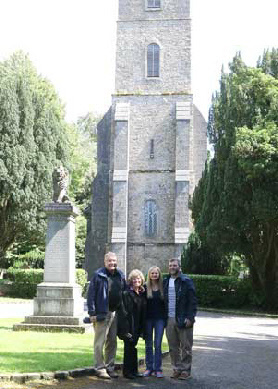 With a bit of research we discovered quite a bit and the family decided to come to Ireland on holiday and to pay Emyvale a visit. On August 3rd last they arrived and had a hearty brunch in The Village Kitchen during which we talked through the information of their forefathers. It turned out that Alexander Roberts was a Blacksmith in Goat Lane (if any of you know where that is in Emyvale Village!!) and another member of the family, John, had a Public House with a sign over the door - 'John Roberts - For Sale - The best Whiskey in Truagh'. They also owned the plot where my parents house was and they owned what we called - Eoin's Field, which is the field where the housing estate is now on the Drumully Road. It was an emotional experience for the visitors. We then went to St. Salvators Church, where Mrs. Wallace kindly helped them search the records where they found Birth Certificates, Marriage Certificates and Death Certificates of their family members. A few days previously I had visited St. Salvators and had located the family burial ground and had help from two gentlemen to clean up the grave. The visitors found it a very touching experience to be so close to their ancestors, when I took them there. We also visited Old Donagh Graveyard and I gave them some of the local history to give them a feeling of what life would have been like when their ancestors lived here in the 1800's. They were extremely thankful for the visit and posted this: We can't thank you enough for yesterday! It was such a special day for my mom and I especially. We felt so touched by the experience and how special you made it by showing us around and telling us the stories. Getting us into the church AND to actually touch the records of our family's baptisms etc was truly amazing. We cannot thank you enough for taking the time and effort before we even got there to arrange things and research for us. We will never forget it and can't wait to show our other Roberts relatives the photos. The McDowell family is also involved here but no research has been carried out on that line of the family yet. Not all visitors come to find their roots but to visit their roots. Many who were born and bred around here have moved to a new place but still come back to visit family. Last week I met with two such sets of visitors. 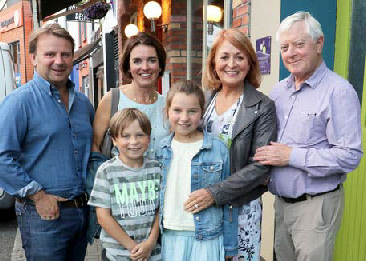 On a street in Monaghan I ran into members of the McQuaid family, Marie and Lorraine with their husbands and Lorraine's children. It was a great surprise and even though it was a quick chat it was terrific to meet my former next door neighbours. We watch out for the progress of Marie and Kieran's son, James, who is playing tennis on the international circuit. Anyhow we were both rushing so I just had a photo and we parted. Great to see you all looking to well. 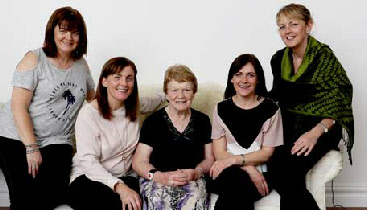 Then a few days later a wee bird told me that two sisters had come home for a short holiday - one from UK and the other from New Zealand, and that they were gathering with other family members in a certain house on Mullan Road. I decided to drop in and when I did they were just about to sit down to a feast. Unfortunately I just had eaten my dinner and was unable to stay so we had a quick chat, a photo, and I left but not before they warned me to be careful on the way home as wild deer are known to be in the area and go cross the road without warning. Thankfully I saw no deer and I hope the two girl travellers had safe journeys home after the holiday. It was great to see Brenda and Patricia McCluskey, who lived on the opposite side of the street from me all those years ago. Of course it was nice to see the other girls there too - Siobhan, Mary and Nancy.